Look at my jewelry and you might guess that I definitely have a thing for copper. When did my love affair with copper start? Who knows? It’s been so long, it might have been in another life time! And who could blame me? But humanity beat me to the punch a looooong time ago. Did you know that copper is the very first metal to be mined and used by ancient people? 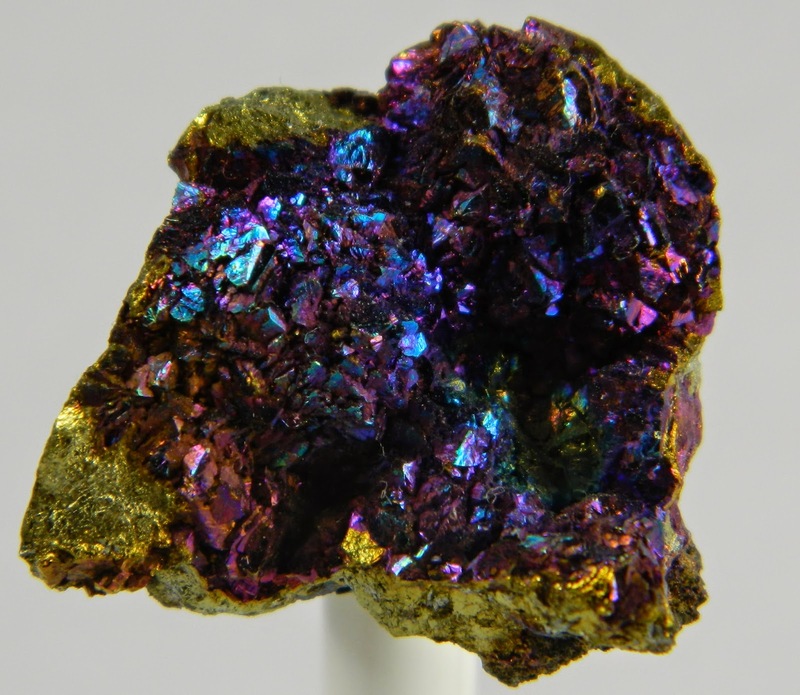 Check out this gorgeous piece of peacock copper ore! We couldn’t live without copper, a necessary trace mineral. I won’t bore you with the fascinating details, but you can read about it in greater detail here and here, if you’d like to find out more. 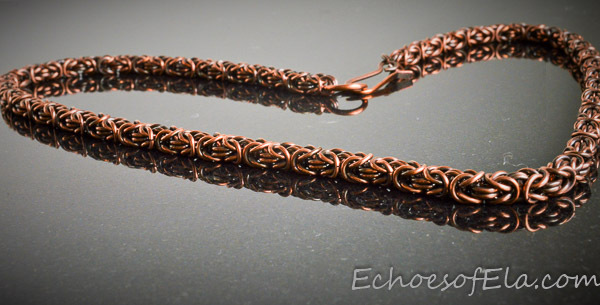 What draws me to copper is its warmth, both in looks and feel, the latter of which makes it very comfortable, soothing even, to wear. It is often used in therapeutic ways and some swear by its ability to calm achy joints. To me copper is enormously attractive from a design stand point for several equally important reasons. For one, it is readily available, mined right here in the US, can be found in a variety of different shapes and forms, from wires to sheets to washers etc. It is a fairly uncomplicated metal to work with and takes on a beautiful patina, which to me, really makes it come alive. Copper is often a component used in combination with other metals to create alloys such as bronze, jewelers brass, even sterling silver. Add to all that the fact that it is fairly inexpensive, well, it doesn’t get any better than that! I have used it to weave! What will be next you ask? Right now I am working on designs that involve soldering as well as creating soldered bezels, which will allow me to include some of my lamp work artist friend’s gorgeous hand crafted glass cabochons. All I can tell you is that there aren’t enough hours in a day to fit in all that I want to do with it! So, stay tuned and I hope I have opened your eyes a little more to the many benefits and opportunities humble copper has to offer! I am also in love with copper (for all of the reasons given in your article) and use it almost exclusively in my designs. I also wear it on a daily basis. Copper is – warm, rich, versatile and goes beautifully with nearly every color – it surprises me that it’s not more popular than gold or silver . 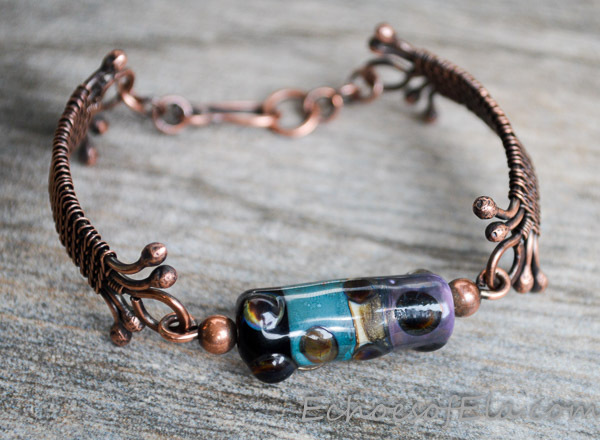 Love the creations you’re shown here – that hammered cuff is fabulous! Thank you Dawn! Yes, I stray a little bit at times, but in the end I always come back to copper! No other metal has the same “feel good” factor! A lot of people at my open house last year told me they never really saw much copper jewelry before they came to my party and it was a huge hit! 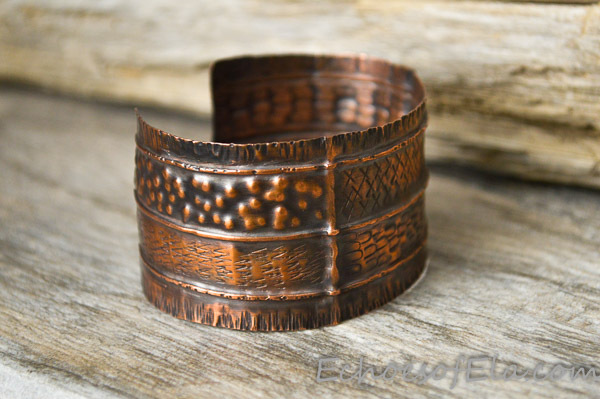 And the cuff was a blast to make! Copper is lovely to work with. I’ve heard some people say that it’s not fit to make an heirloom piece from it and that only silver and gold count, but I disagree. I remember that there was a time when I was a teenager – centuries ago ;-) – when copper was much in demand, only some people didn’t wear it because they were afraid it could turn the skin green. It’s wonderful to see that it’s coming back more again and your pieces show that it’s definitely fit for heirloom pieces! My favorite is the woven bracelet, it’s gorgeous. Thank you Cat! While I do understand why some people feel that way about heirlooms, I agree with you copper is every bit as worthy. To me the artistry and craftsmanship has a lot to do with that. It’s funny that you mention that some people shy away from wearing it, because they are afraid it might turn their skin green. I have not had any issues with that. But silver can turn your skin black and it remains a popular choice! 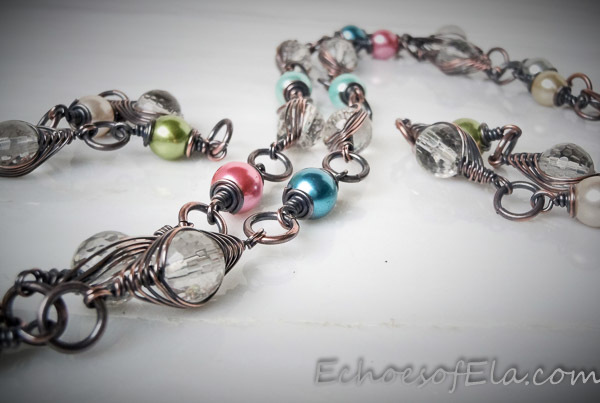 I am honored that you would consider my jewelry heirloom worthy:) The woven bracelet is so much fun to create! I too love copper, especially when it is aged and has a nice dark patina on it. I wore a copper bracelet to work the other day and got some comments on it, mainly because of it being copper. 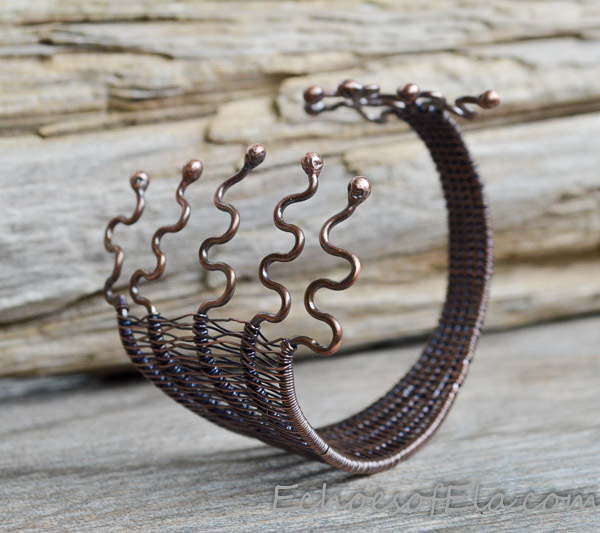 The woven bracelet is awesome looks so natural and organic. Thank you Carina! I really appreciate that!